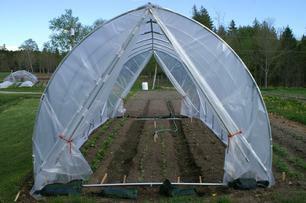 These are the Original High Tunnel Hoop Bender design "Now copied and sold by several companies for $69.99." 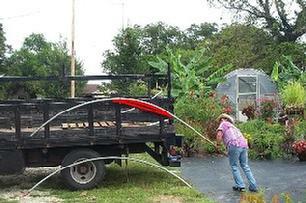 I answer my phone 7 days a week, always have... 903-497-1158.
and the 20' wide hoops are 9 1/2' tall. 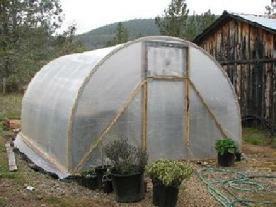 Any of these hoops can be raised taller simply by installing taller ground anchor post. So, Whats The Difference In These Bending Tools? Our model number system is quite simple; Each model number begins with one or more Letters which indicate the Series followed by one or more numbers. The letters indicate the bender Series and the numbers indicate the Width of Greenhouse Hoop in (feet) that specific bender is designed to produce when using the recommended size and gauge of tubing specific to that hoop. For example the "DY"& "C" & "PF" series each having the same three hoop sizes. Each has a 10 ft, a 12ft and a 20 ft hoop size. So what is the difference between a DY-10, C-10 and a PF-10? All three build a 10 ft hoop? YES they do. 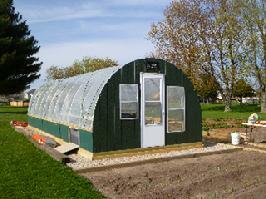 The difference is the total amount of available bending surface of the specific series. All of the "DY" series have about 24 inches of usable bending surface which requires about 6 or 7 bending strokes (motions) to complete the bending of one 10' 6" length of tubing. Where as the longer "C" series has about 48 inches of bending surface thereby requiring only 3 or 4 bending strokes, while the "PF" series has 72 inches of bending surface requiring only 1 long and 2 short strokes to complete the ends. With that said, what is the advantage of having more bending surface per bending stroke? While it is quite easy to bend steel tubing on any of these benders, none the less, it is a physical exertion and if you are planning on bending several dozen hoops on a regular basis the "C" series benders reduces the fatigue from the bending process. 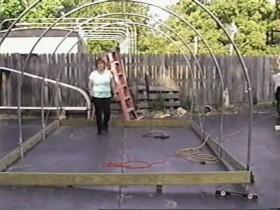 The "PF"reduces it even more, if one is planning on building hundreds of greenhouse hoops, either for their own nursery or perhaps to build greenhouse kits for resale to others, the more bending surface the better.